IAN COLE reports on the 2012 SJA British Sports Journalism Awards, staged at the Grand Connaught Rooms in London’s Covent Garden, on Monday, March 25 2013. Britain’s sports journalists bade a fond farewell to Olympic year 2012 with a medal ceremony of their own to recognise the Sports Writer, Sports Photographer, Sports Broadcaster and Sports Newspaper of the Year. 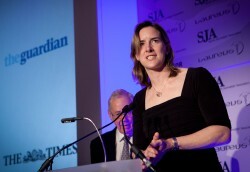 The Sports Journalists’ Association’s annual British Sports Journalism Awards, staged at the Grand Connaught Rooms in central London and supported by Laureus and BetVictor, reflected excellence across all branches of the media with the principal awards going to Telegraph sports writer Paul Hayward, photographer Adrian Dennis of Agence France-Presse, Clare Balding of BBC and Channel 4, and the old Thunderer itself, The Times. 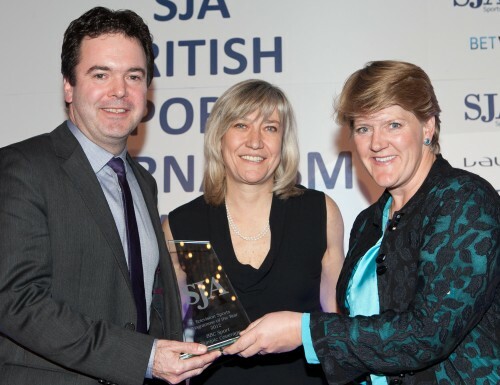 Hayward previously won the coveted John Bromley Trophy for Sports Writer of the Year 16 years ago. For Dennis, who also won a special award for his London Games portfolio, it was first-time recognition after a year which also found him grass-rooting at the Weston Beach Race and Austin Healey Vintage Car Race. Balding, a familiar face on television screens during BBC’s Olympic coverage and then C4’s coverage of the Paralympics, was a popular winner of Sports Broadcaster of the Year on an outstanding night for the BBC, who also won TV and Radio Sports Programmes, for their Olympic coverage and Test Match Special respectively, and took the Laureus-sponsored Sports Website of the Year trophy. As for The Times, sports editor Tim Hallissey and his team walked away with Sports Newspaper of the Year for a third successive time. 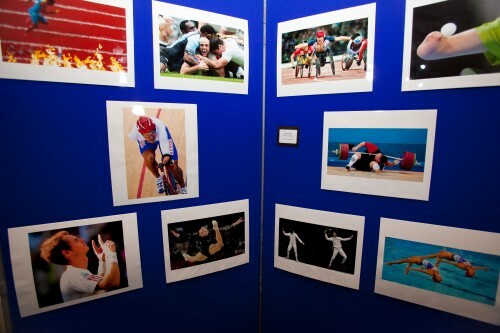 The SJA’s writing and photography awards are decided by panels of judges drawn from a broad sweep of the sports media and related industries. 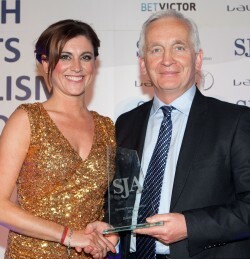 Sports Writer of the Year is an accolade bestowed by a panel of national newspaper sports editors, while the broadcast awards are the result of a poll of the SJA’s 750-plus membership. Prominent among a variety of other awards was another victory in the Specialist Correspondent category for former England cricket captain Michael Atherton, now cricket correspondent of The Times. 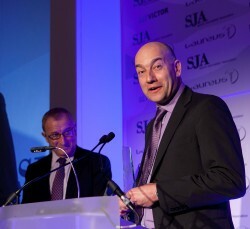 Atherton was judged the winner of this category ahead of more than 50 other entries from a broad scope of sports, in what was an overall record entry for the SJA awards. A new era at the Mail on Sunday sports desk began with Patrick Collins winning Sports Columnist of the Year for a fifth time, while Martha Kelner was declared Young Sports Writer and collecting the Ian Wooldridge Trophy. Scoop of the Year was the Kevin Pietersen text scandal in the England cricket team, bringing an award for the Daily Mail’s Lawrence Booth, while David Walsh of the Sunday Times achieved the unique double in the four decades of these awards by winning both Sports News Reporter and Sports Feature Writer for his long-term work in exposing the disgraced Tour de France cyclist Lance Armstrong as a drugs cheat. Sports Picture of the Year was taken by Andrew Boyers, of Action Images, while freelance Ed Hawkins retained the BetVictor Sports Betting Writer of the Year title. 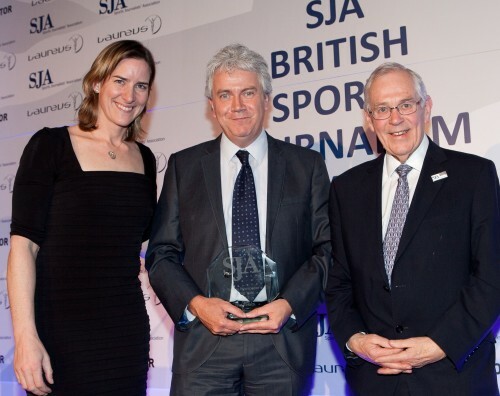 The SJA’s Doug Gardner Award, in recognition for services to the profession, went to Barry Newcombe, who is standing down after a record seven-year term as the Association’s chairman, and a career in which he has been covering the Wimbledon championships for almost half a century and has been the BOA’s press attache at four successive Olympic Games. In a rare but sincere message to the media, Britain’s greatest female rower thanked those whose task it is to write and commentate on sporting greatness for their part in making London 2012 the greatest show this country has seen, writes Ian Cole. “You guys captured the whole mood of the Olympics perfectly,” said Grainger. “Somehow you absorbed the spirit, the drama and the whole essence of our love for the Games and you managed to translate it for the public, for your readers, viewers and listeners. It was a touching moment, applauded by almost 400 diners sitting beneath the chandeliers in London’s Grand Connaught Rooms, an evening supported by Laureus and BetVictor which attracted the best of British sports journalism and had the bonus of some fine sporting celebrities, notably former All Black great Sean Fitzpatrick, representing Laureus. The purpose of the evening, of course, was to unveil a new set of champions of our own trade – a Sports Writer, Sports Photographer and Sports Broadcaster of the Year, as well as many other awards including the Sports Newspaper of the Year and Laureus Sports Website. My memories of a spectacular night are dominated by Clare Balding and David Walsh. 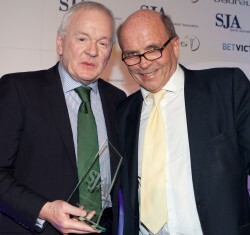 Balding, who has risen from SJA committee member and part-time showjumping scribe to one of the most familiar faces on TV in about 20 years, was clear winner of our Broadcaster of the Year award. She anchored many of BBC television’s Olympic transmissions and C4′s Paralympic coverage. In the space of a few weeks last spring she commentated on a Boat Race, which became a front page story when a protester swam in front of the crews, the Grand National and then the Diamond Jubilee pageant on the Thames. As for Walsh, his face seemed to be on the screen as a shortlisted nomination for almost every award (in fact, it was five!). The Sunday Times man had to be content with a unique double, winning the Sports Feature Writer and Sports News Reporter in the same year. An achievement which amused him. “I’ve never been accused of being a news reporter before,” he said. Walsh’s greatest success of the evening, he admitted, was to get his daughter, Mollie, photographed beside Balding. Among the customary Oscar-style acceptance speeches from 24 winners there was genuine emotion from the Mail on Sunday’s Martha Kelner and Patrick Collins, who had seen their popular sports editor Malcolm Vallerius depart suddenly a couple of weeks previously. Collins, five times Sports Writer of the Year, now has the distinction of being named Sports Columnist five times. Competition among our photographers was as fierce as ever. 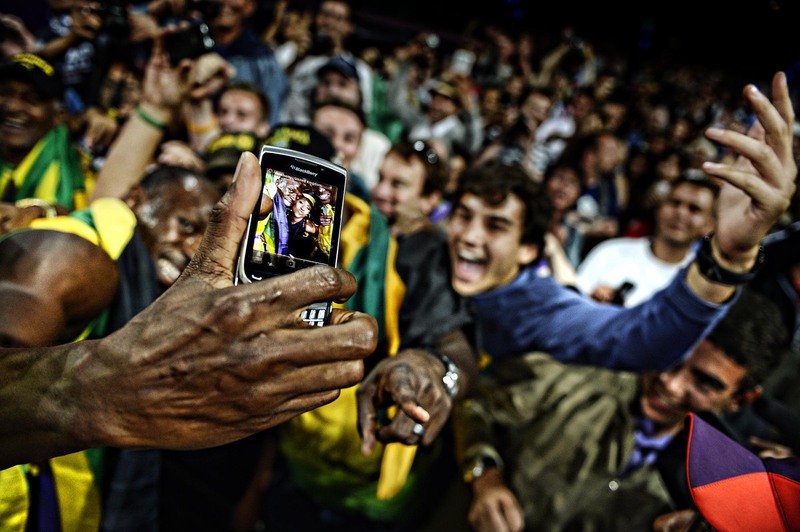 The one-off London Games Portfolio category produced a wealth of images from the Olympics and Paralympics. Winner was Adrian Dennis from Agence France-Presse. Dennis also submitted evidence that a snapper’s life is not all glamour, however, and his portfolio which included images from the Austin Healey Vintage Car Festival and the world darts championships, impressed the judges sufficiently to award him the top accolade of Sports Photographer of the Year. It was a pity that the Telegraph’s Paul Hayward was not present to reclaim in person the Sports Writer of the Year award he last won in 1996 but work comes first and Hayward, like several of his rivals, was in Montenegro with the England football team. Also on active service overseas were Michael Atherton of The Times, winner of Specialist Correspondent for a third time, and members of the Test Match Special team, voted Best Radio Sports Programme by the SJA membership. The value of TMS, especially abroad, was emphasised only a few hours after the last celebratory drink was downed in London when those of us snuggling under the duvet with our earphones on a freezing night heard Jonathan Agnew and Michael Vaughan commentate from Auckland on England’s victorious draw to save the series against New Zealand. Not selected for that tour was Wisden editor Lawrence Booth of the Daily Mail, which meant he was in the room to receive Sports Scoop of the Year for the Kevin Pietersen Test texts scandal. Writers sometimes forget that interviews are often only as good as the interviewee but Booth made a point of thanking Pietersen for his part in the scoop, as well as praising Head of Sport Lee Clayton for finding a back page space for cricket during the Olympics. We also saw Oxford University undergraduate James Gheerbrant, 22, become the second winner of the David Welch Student Writer award and our own chairman, Barry Newcombe, take home the Doug Gardner Award for services to the SJA. We hope Newcs was suitably embarrassed to see himself improperly attired in a 1970s picture of a British tennis writers’ team which took on the Americans at a Davis Cup-tie. 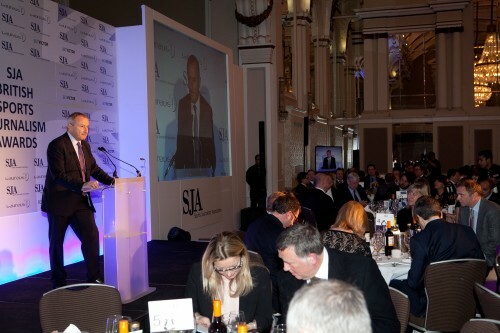 The award was well-deserved for a man who stands down after seven years as SJA chairman – the longest in our 65-year history – and who has served at four Olympics as BOA media attaché. He’s come a long way since he ran the latest fish prices from Northampton Market to the offices of the Northampton Chronicle. 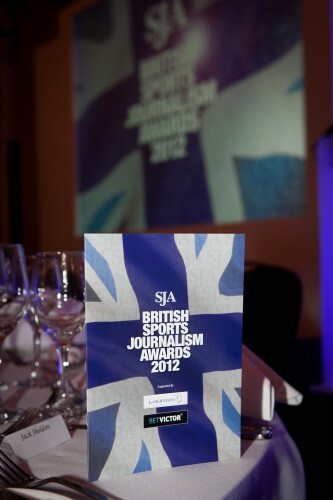 And we at the SJA have come a long way since this event was scrambled together in a room above a back-street pub. A great night, then, smoothly and professionally hosted by presenter Jim Rosenthal and expertly organised by Martin Castle and his team from Start2Finish.